Rory McAllister celebrates his opener. Peterhead manager Jim McInally was a pleased man following his side’s 2-0 victory over Airdrie at Balmoor on Saturday. The win leaves the Toon side on 14 points, two points adrift of their opponents and that fourth spot play-off place, a target set out by McInally before the game. The three points on Saturday was Peterhead’s first win in eight games and the manager will be hoping it will kick-start the Toon’s season. The game didn’t exactly start as the manager had expected but by the end the three points were all that mattered. After asking his players to work theior way into the game the tema decided to go for it from the get go. It wasn’t all plain sailing for the Toon team and Airdrie did create some chances. cracking one off the bar. McInally said: “They played at a good tempo and could have been a couple of goals up before we scored. Nerves due to recent results may have played a part in the rest of the fixture as the Peterhead players seemed to their way a bit after the goal and coming into the second half. 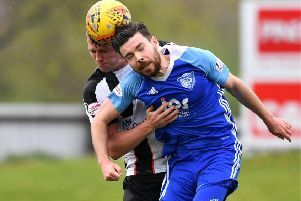 Individual mistakes have cost Peterhead in recent games and perhaps there was a bit of fear from the players that they would make a costly error again. Managers sometimes live and die by their substitutions and McInally certainly seemed to get his spot on to secure the three points.